gouache on toy pig, appx. 4 inches long. Meat Sections, now in 3D! I picked up the plain farm toy at Cliff's Variety in the castro. Painted it a little pinker and added the butchery diagram. I kind of love it. I'll be selling some MEAT SECTIONS (and other) wares at Indie Mart in SF on June 6th. 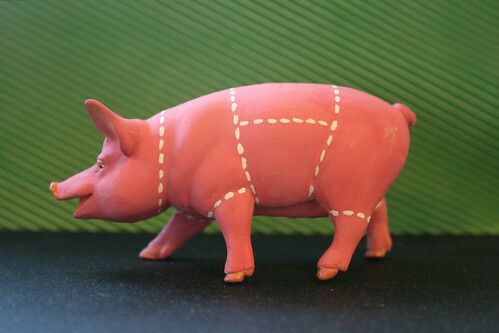 There will definitely be a very nice selection of 3D pig butchery models there for you to take home and love. Like meat? Like sections? Then you've come to the right place. This space is for my annual daily project - MEAT SECTIONS - which involves drawing (and perhaps the occasional photo) of butchery-style diagrams, of not just the standard pig, cow, lamb, and other edible creatures, but odder items as well. Interested in your OWN meat sections action? Check out my etsy shop, where many of these lovely hunks of meat are available for sale. Not seeing what you want? If you are interested in a particular MEAT SECTION, contact me and I'll whip something up, just for you. Sweet, right? I'd love to spread the MEAT SECTIONS love, so please do contact me if you are interested in using one of my images on your blog or for your business. Each daily image is an original artwork, produced by me. All of my original pieces, viewed here or elsewhere, are my proprietary copyrighted works, and may not be reproduced without my permission.